Like its predecessors the model below was estimated using the “Tobit” method with the endpoints constrained to values of one and sixteen. 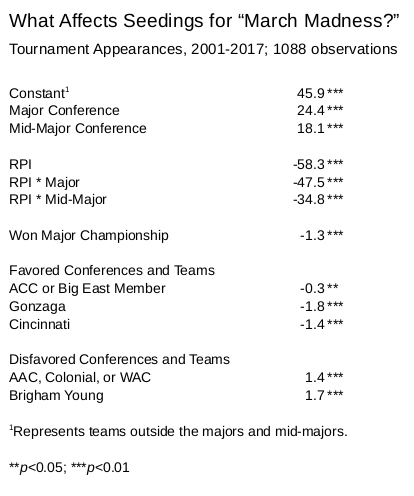 I’ve also reanalyzed the results for conference champions and have determined that only major conference champions receive a seeding bonus of 1.3 seeding ranks. In other words, a major-conference team that wins its conference championship will be promoted at least one full rank in the seedings. Finally I address the “favoritism” question in the lower half of the table. The Committee has awarded teams belonging to the ACC and Big East conferences a bonus of about one third of a rank. The Committee has also looked especially fondly at two teams over the years, mid-majors Gonzaga and Cincinnati. That Gonzaga is one of these should not be a surprise to anyone who follows the Tournament. It is one of only five schools, along with Duke, Kansas, MIchigan State, and Wisconsin, to have qualified for the Tournament every year since 2000. Cincinnati has the second most appearances, twelve, of any team not in a major conference. On the other side of the ledger, three of the mid-major conferences have fared more poorly in the seedings than the others. The Committee appeared to view with suspicion teams from the American Athletic, Colonial, and Western Athletic Conferences. Teams from these conferences are seeded on average about one and a half rankings below what those teams’ performances would predict. 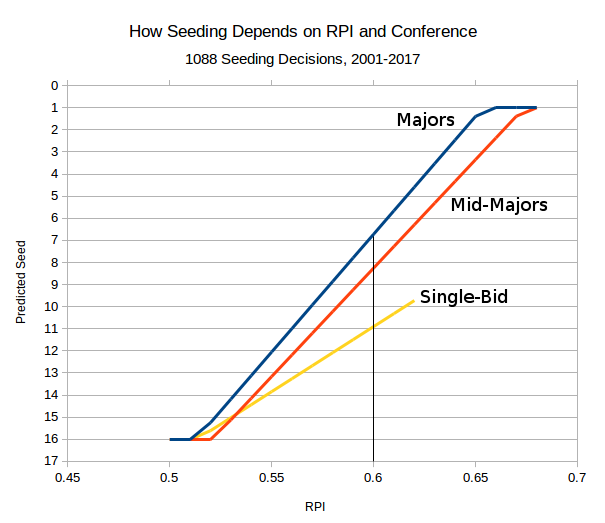 In addition, the Committee has historically marked down teams from Brigham Young University, seeding them nearly two ranks below what their RPI and conference membership would predict. Previous PostDo Conference Championships Matter? Next PostDoes the Tournament Committee Play Favorites?